Involving employees at all levels in day-to-day decision-making and giving them more control over their working practices leads to win-win outcomes for both performance and health and well-being, says Professor Peter Totterdill, chief executive of the UK Work Organisation Network (UK WON). Workplace innovation is an inherently social process. It is about building skills and competences through creative collaboration. Workplace innovation is fuelled by open dialogue, knowledge sharing, experimentation and learning in which diverse stakeholders including employees, trade unions, managers and customers, are given a voice in the creation of new models of collaboration and new social relationships. It seeks to build bridges between the strategic knowledge of the leadership, the professional and tacit knowledge of frontline employees, and the organisational design knowledge of experts. It seeks to engage all stakeholders in dialogue in which the force of the better argument prevails. Factors in the work environment which determine the extent to which employees can develop and use their competencies and creative potential include empowering job design; self-organised team working; structured opportunities for reflection, learning and improvement; high involvement innovation practices; the encouragement of entrepreneurial behaviour at all levels of the organisation; and employee representation in strategic decision-making. It is time to close the evidence-practice gap by shifting towards the creation of a ‘joint intelligence’ shared by all stakeholders in the workplace and at the wider economic and social level. The creation of EUWIN (the European Workplace Innovation Network) by the European Commission at the end of 2012 provided an opportunity to address the need for a new type of dialogue between researchers and practitioners. EUWIN’s task is to promote the dissemination of workplace innovation throughout Europe through knowledge sharing and dialogue. Currently, there are few spaces in which researchers and practitioners interact in ways that lead to knowledge sharing and the collaborative creation of new insights and understanding. Researchers and practitioners need to co-create a framework for understanding, stimulating and enabling workplaces that achieve high performance through employee empowerment and engagement. Such a framework, which we call The Fifth Element, can bring together research evidence and practical experience through a combination of online collaboration and open dialogue between researchers and practitioners. Its aim is to create a resource that will support practitioners in guiding change as well as identifying new research agendas. At the same time it can never be a blueprint or recipe book because deployment within a specific workplace context is inherently innovative, involving experimentation, trial and error, and shared learning. The mutually-reinforcing impact of workplace partnership, shared learning, high involvement innovation, enabling organisational structures and systems, self-organised teams and empowering job design can create a tangible effect in workplaces which is hard to quantify but which is often described in terms of ‘culture’ and ‘engagement’. The metaphor of the Fifth Element is a useful way of capturing this essence, describing an alchemic transformation that can only take place when the other four elements combine. Teamworking is core to the concept of effective job design. Empowered, self-organised teams are a basic building block for workplace innovation. Teams share knowledge and problems, break down barriers and demarcations, and generate ideas for improvement, innovation and growth using the insight that day-to-day work experiences give them. Organisational walls and ceilings that allocate people to departments, divisions, grades and professions inevitably tend to constrain the way that people work together, creating separate silos that put barriers in the way of doing a good job. 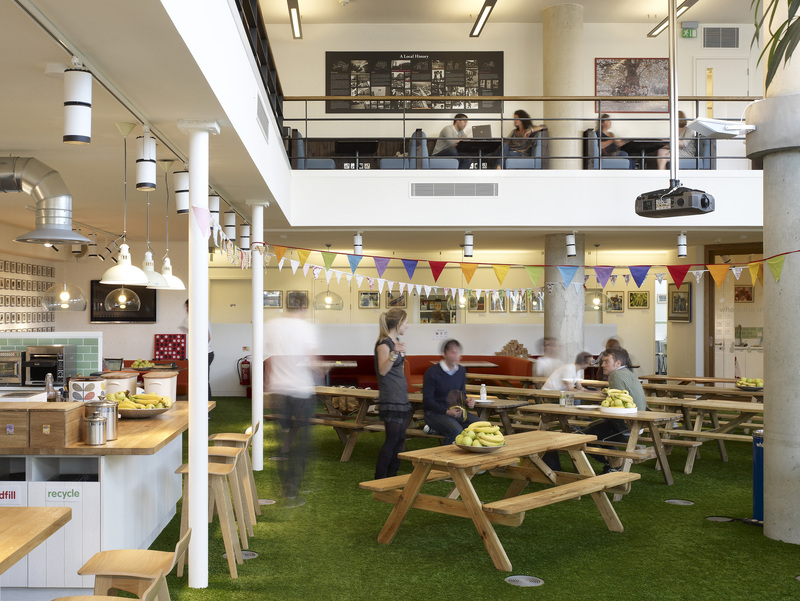 For example Innocent is an innovative UK company that produces smoothies, juices and vegetable pots. Its success depends on a culture that values creativity, openness and the sharing of ideas at every level. 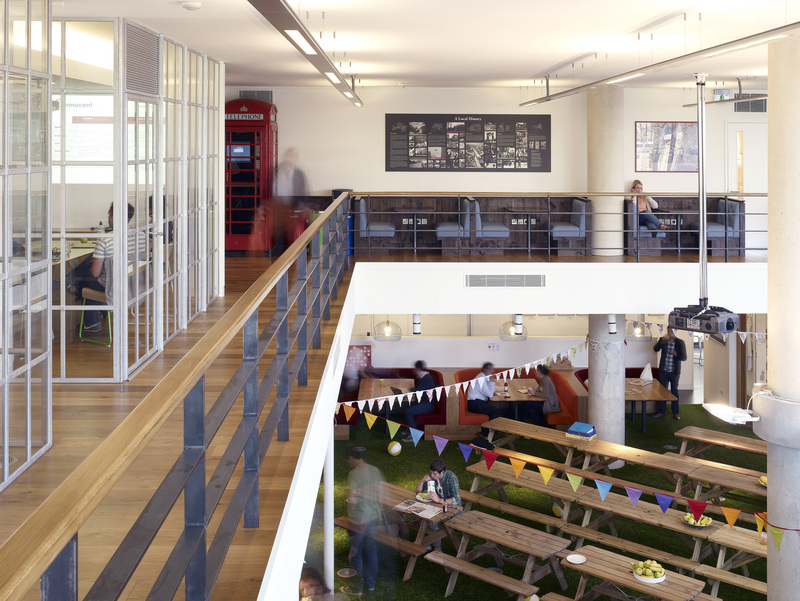 Fruit Towers, its HQ in London (pictured), is spread over four open-plan floors but seating for everyone including senior management is allocated randomly. Everyone gets maximum visibility and interacts with people from different functions. They get a broader understanding of different roles and how Innocent works as a whole. Nowhere is this better illustrated than in healthcare. Patients with complex or long-term conditions achieve better clinical outcomes and quality of life when they are treated by multidisciplinary teams that transcend professional and departmental boundaries, rather than by separate specialists who only communicate with each other by means of the patient’s medical record. Systems and procedures that govern decision-making, resource allocation and standard operating procedures must also be aligned with commitment to empowerment and trust rather than reflecting a culture of centralised control and micro-management. A knowledge economy is one firmly rooted in innovation, popularly associated with R&D and ICT investment. However this association turns out to be misleading. A continual stream of ideas is a vital resource for product, service or process improvement and innovation. This can be reflected in times and spaces where people at work can discuss ideas with their co-workers or in their team meetings. 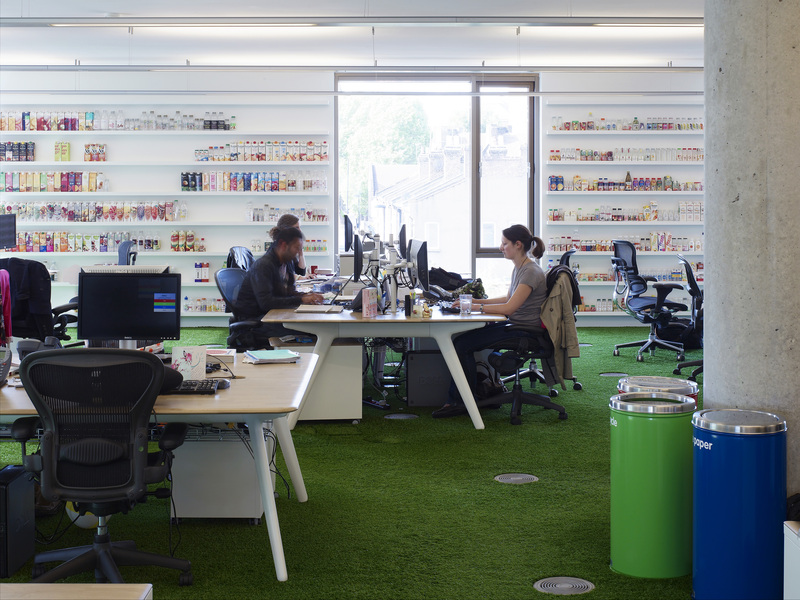 Buzz boards enable ideas to be shared and dedicated spaces can enable people to think in different ways together. Meetings in cafés can offer a creative time away from the immediate pressures of the workplace. Ad hoc teams, away days and times when people who otherwise wouldn’t meet are mixed together can generate a pool of dialogue and creativity. It can be as simple as establishing a regular forum that enables staff at all levels of an organisation to leave job titles and hierarchies behind, and to explore new ideas through open and free-thinking discussion. In Devon and Cornwall Police these forums have generated ideas for improving the service at a time of financial stringency. Electric bicycles, for example, are a way of improving visibility while ensuring that officers can cover enough territory in remote rural areas. Likewise opportunities such as Down Tools Week at Red Gate Software enable staff to step back from the day job to develop their own ideas for new products and ways of working. Ideas for improving the business should also be part of the day job. Innocent encourages all staff to think continuously about ideas for improvement and innovation. Being 70% sure that an idea will work is sufficient to get the support needed to take it forward. The Met Office argues strongly that new ideas can come from anyone. A network of volunteers recruited from every level of the organisation is gradually establishing a culture of innovation in ways that break down silos and release new waves of creativity. At its most basic level workplace partnership is a way of dealing proactively with industrial relations issues, ensuring early consultation on pay and conditions, employment changes and organisational restructuring. Partnership between management, employees and trade unions can take many forms, but always requires openness, transparency and two-way communication. At the very least it can be an effective tool for positive industrial relations, minimising conflict and resistance to change. Involving employee representatives in both design and implementation of workplace innovation can help to ensure ‘ownership’ of the process and alleviate some of the problems of inertia and innovation decay seen elsewhere. In this respect, partnership becomes a framework for animation and driving innovation. So what is the outcome when these four elements combine? The answer is a tangible and sustainable change in the day to day culture of an organisation which includes across the board improvements in communications, leadership and employee engagement, higher performance, enhanced customer care and a self-perpetuating regime of innovation. It is the buzz you get in a workplace where employees at every level use and develop their knowledge, experience and creativity to the full, where employees come to work to improve the organisation as well deliver their functional tasks in the best possible way.